Soon after her 40th birthday, Dawn Hughes did what women are told to do when they reach that age and got her first mammogram. With no family history of cancer or any symptoms, Dawn thought it would be a routine screening. However, she was wrong. On May 27, 2016, she was diagnosed with Stage 1 breast cancer. While Dawn was waging a health battle, she also was undergoing a personal one. While she was healing from her mastectomy, she faced many challenges. She has a series of infections, allergic reactions, hospitalizations, as well as neuropathy. Dawn attributes making it through cancer to her supportive network of family, friends, work family, and most importantly her faith. 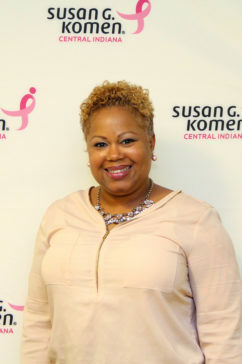 Susan G. Komen Central Indiana hopes to reduce breast cancer disparities for African-American women. After going through her experience, it’s become Dawn’s mission to help educate and assist minorities about breast cancer. She found that so much breast cancer information was geared toward Caucasian women. For that reason, she donated her tissue to clinical studies in hopes of finding valuable knowledge through research studies.